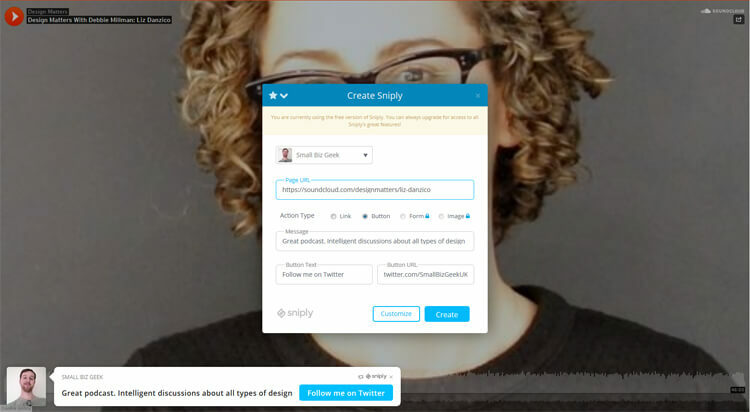 Sniply is a free content curation tool that adds a floating overlayed message written by you to every piece of content you “Snip”. Your Twitter profile picture and link is automatically added to every Snip, and you can link out to an external link of your choice. If your social media shares go viral Sniply is a way of promoting your own stuff off the back of other excellent content. You’re getting a free piggyback ride. If you’re serious about curating content, you can give more of the attention to the author of the content like with this Snip. It’s more altruistic and social media users will see that. 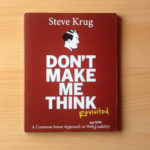 The original author will appreciate the generous mention too if they are mentioned using the @ attribute..
Blog posts, videos, podcasts, infographics and images can all be passed through Sniply, treated with the link shortener and given the unique overlayed message. 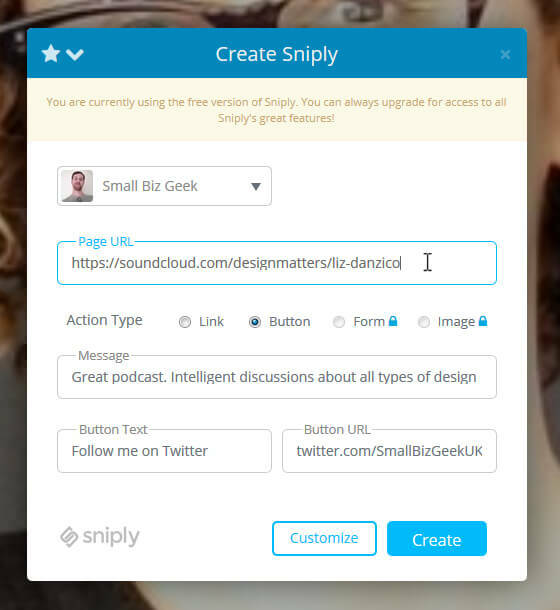 You sign up to Sniply, set up a profile and run the link you want to share through the Snip creator. 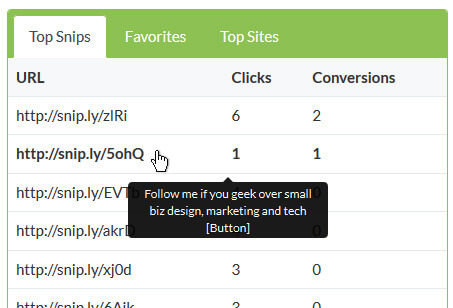 While you’re at it, choose an external link and some text for the blue button. In the example below, I shared a link to a podcast on SoundCloud. 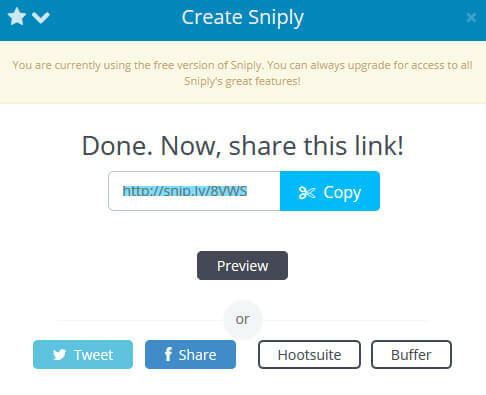 While you’re creating the Snip, you’ll be shown a preview of what everything will look like to someone who clicks your link. If you’re happy with what you see, click Create and you’ll be presented with a short link which you can share on social media or even include in your blog posts. It’s not a good idea to use these links on Sniply though, because the open graph data doesn’t get pulled into your FB status box. It gets even better… tracking analytics are included, displaying the number of clicks a link got and how many people visited the blue button (a conversion). 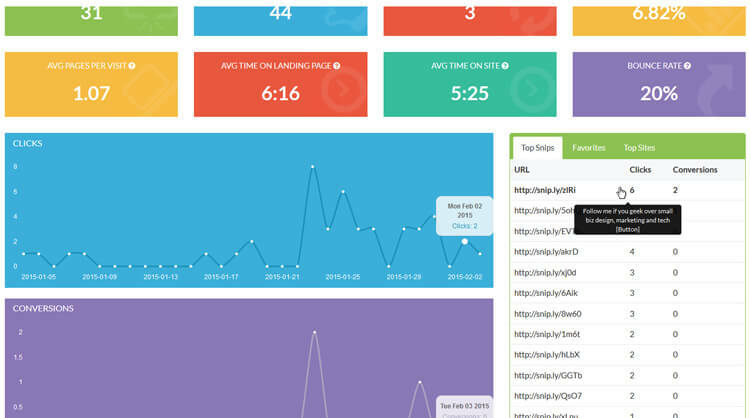 The main dashboard gives a performance overview and includes conversion rate, bounce rate and average time spent on the page. 80% of people visiting my curated links are spending an average of 5 minutes consuming content I share. The other 20% are spending less than 10 seconds on the page. Statistics like this can give you a clue as to what needs improving with your shares. Maybe some content is too long. The content might be off topic or less relevant to the audience. Perhaps it’s being shared at the wrong time on social media. Your overlayed message and call to action might do better if you tweak it. While the analytics are nice to have, the numbers can be difficult to understand because I share podcasts as well as videos that can be up to an hour in length but I also share short blogs that take just a few minutes to read. With so many variables at play you might not derive much information about how your followers consume what you share with them. If you want, you can schedule these links in the free version of Buffer (which has limitations) or you could schedule the links in Tweetdeck (no limits). It’s handy being able to leverage your time with Snipped links will be published on the dates/times you’ve programmed. If you want to take automation a little further with Sniply, I’ve outlined a method I’ve been experimenting with below. This is extremely for aggregating content from sources you like, trust and want to curate on autopilot. As part of the free Sniply version, RSS is supported and this presents some excellent automatic aggregation opportunities together with Twitterfeed. 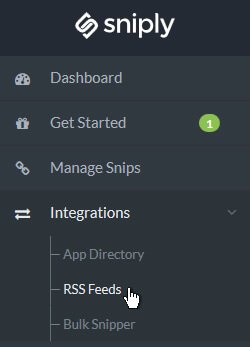 If you’re interested in setting up RSS with Sniply you can do that under the Integrations menu. You’ll need to paste in a source feed, and that is usually the RSS feed of a website, YouTube channel, podcast, whatever – as long as it is a valid RSS feed you can use it. If you’re interested in knowing how I used Sniply with an RSS feed, watch my tutorial video below for a step by step guide. Give the free version a try. I strongly suggest signing into your Twitter account and then going to the Sniply website and using it under your Twitter account. You’ll be asked to verify the app as part of your Twitter. There are obviously limitations, including a 1000 click quota. 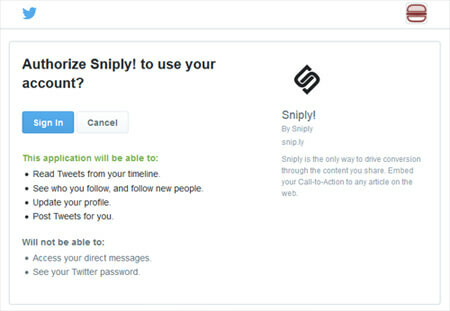 If you have different websites/projects and you want to use Sniply for these, open a new Sniply account under a different Twitter account related to your other site. It makes sense to do that instead of upgrading to the paid version just to add more profiles under one Sniply account. You can compare the free version to the paid version and see the differences. But I think you’ll agree it can get very expensive subscribing to various services when there are workarounds. Sharing valuable information with followers conditions people to expect what you share to be worth consuming. As part of this content curation you can mix in some of your own content and get targeted clicks and good traffic to your website.